We almost fell off the chart today. It would not be the first time. I already had to rescale it once since first creating it (Certainty vs. Uncertainty). The following chart shows how fast the yellow "You Are Here" point is moving in the first chart. 1. Why are we moving so slowly? 2. Why aren't we moving closer to the deflationary zone? I would argue that it might not be fear, at least not yet. It may instead be an increasing realization that the era of making easy money off of money is coming to an end. Put another way, I believe that there are too many investment dollars chasing too few good ideas. If Spain, and other Mediterranean countries, cannot pay their bills now, these trends suggest that in the future they will become increasingly unable or even unwilling to do so. Bills? That sounds an awful lot like debt. I thought birth rates were the problem. Says so right in the title. What's going on? If you have a lot of debt then you will need a lot of children to pay it? Oh, I see. That actually does make some sense. 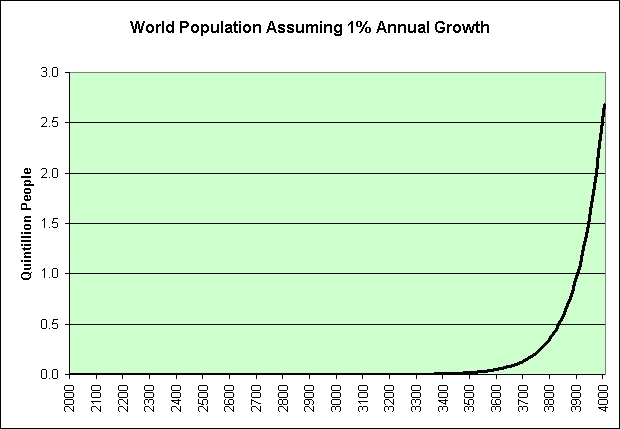 What's a good annual population growth rate to fix the world's problems then? 1%? Yes! If we can achieve that growth rate over the long-term, then how much prosperity will we have in the year 4000? 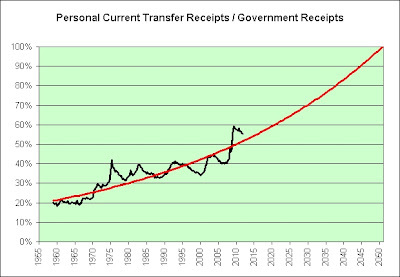 2.7 quintillion people (2.7 million trillion people) paying bills! That's gotta be good! Having a hard time picturing it? Can't blame you. Let me help. That's 11.6 people per square inch of the earth's land surface. There will be so much prosperity we won't know what to do with it all. I sure hope everyone has a garden attached to the roof of their single-occupancy micro-vehicle as they whisk to and from work. Good times! We're smarter than locusts! Nothing will stop us! Mwuhahaha! Why are shares of Sears Holdings (SHLD -8.97%) down? The stock fell nearly 9% Wednesday afternoon, but there wasn't an apparent reason. I blame pharrisa on the Yahoo message boards. The stock's down 35% since March 19, 2012. Without that fear mongering, the stock would be trading on its strong fundamentals. During the recent recession, the observed decrease in GDP corresponded to a higher increase in the unemployment rate than Okun’s law would predict. Our analysis suggests that in recent years there have been changes in the relationship between (i) GDP growth and changes in the unemployment rate and (ii) changes in the employment-to-population ratio and changes in the unemployment rate. These changes cast doubt on using these relationships to predict future unemployment. It's only a matter of time! Don't be concerned by today's new record lows! All this means that Tips investors should beware. Although Tips may compensate holders for future inflation, the interest rate that they offer is far too low to offset the risk of rising rates. As economic growth recovers and real rates rise, the price of Tips will fall leaving Tips investors with large losses in the face of accelerating inflation. Prices are falling on expectations that the world won't use as much oil this year as previously thought. Europe's financial crisis is the most immediate concern, but there have been plenty of signs of weaker demand. 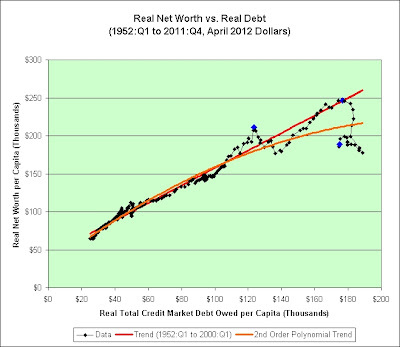 The trend in red implies that each $1 in real credit growth helps create $1.15 in real net worth growth. Unfortunately, a kind of a malaise of some sort has recently appeared and only some of it is understandable. An elaborate Rube Goldberg-type gag ends the cartoon. The Coyote uses a tiny slingshot to knock loose a stick holding up a watering can suspended on a wooden yardarm. The can tips and water pours onto a plant which has a wooden match attached to it. The plant grows and the match strikes against a rock and lights a stick of dynamite. On top of the dynamite is a boot with a brick in it. The blast sends the boot ontop of a teeter board, which rises and releases a mouse in a cage at the other end. The mouse runs to grab a piece of cheese on a scale. A weight on the other end of the scale falls, pulling the trigger on a rifle attached to a cliff. A bullet from the rifle ricochets off two metal bullseyes and knocks down an upright cannon. The wick on the cannon is lit by a nearby candle, which fires a ball that goes through two funnels and plummets on top of the unsuspecting coyote. After the coyote is bashed into the ground, 'The End' appears on the cannon ball. Just like our economy, *nobody* could have seen it coming! The Rube Goldberg-type gag begins at 4:48. 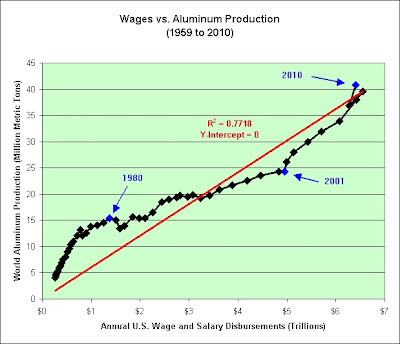 I've added a bonus trend line based on the observations of Anonymous in the comments. 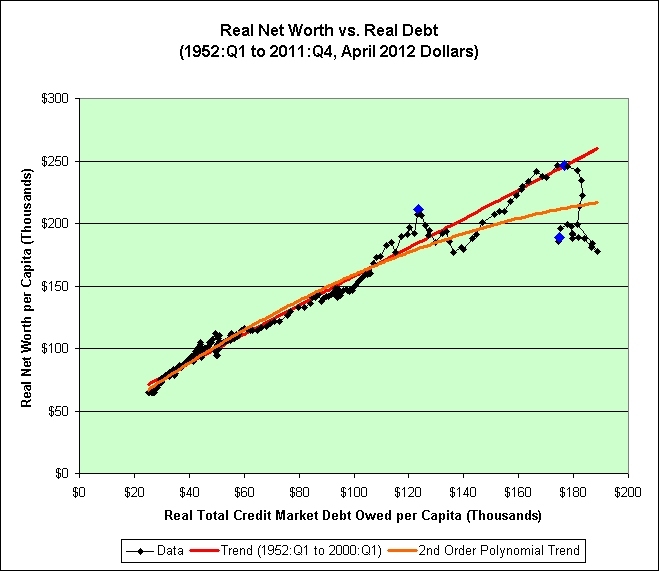 It shows the declining bang for the buck as we take on ever increasing amounts of debt. Take personal income and subtract off wage and salary disbursements. In general, that's fairly effortless work. Right? 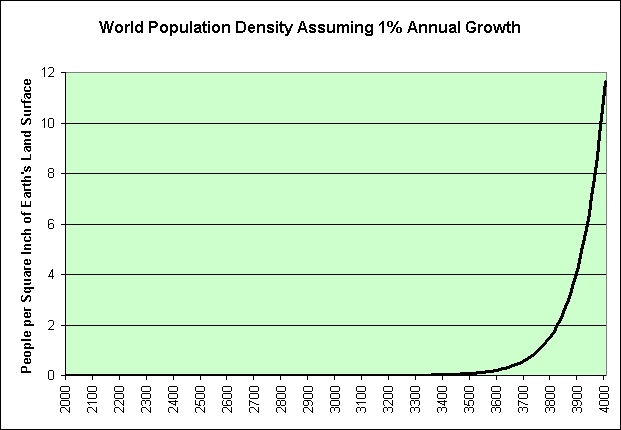 Then adjust by population growth and inflation. That's what the following chart shows. 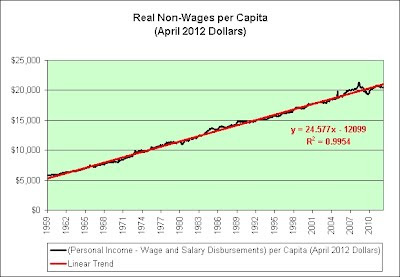 The "average" person makes just over $20,000 per year in non-wages. In real inflation adjusted terms, this amount has increased roughly $25 per month since 1959. 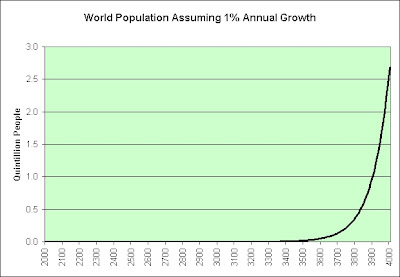 Oddly enough, it isn't exponential growth. 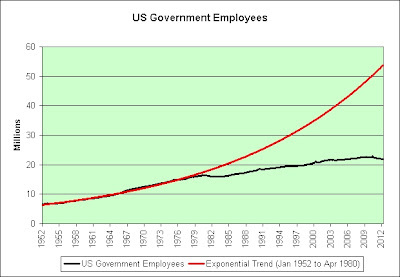 As seen in the chart, it is linear growth and it has grown like clockwork (0.995 correlation) for 50 years or more. It's the closest thing to a "sure thing" that I've ever seen. So, what seems to be the problem? Let's zoom in a bit to show only the most recent years. 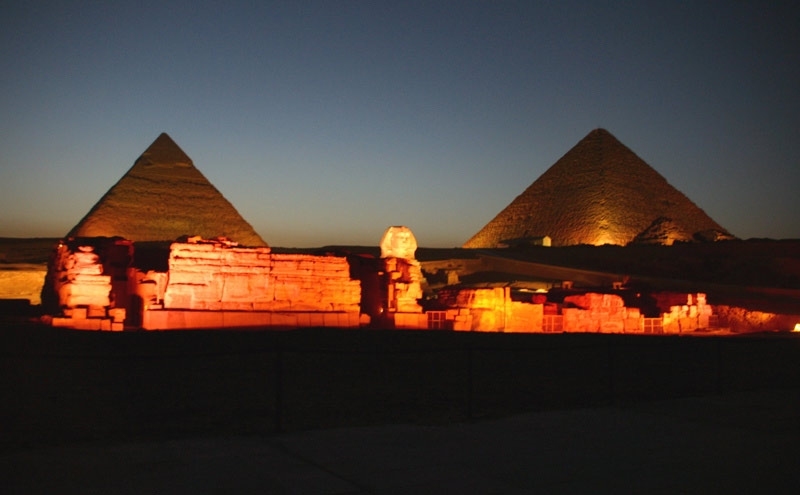 Since 2007, the growth rate has been reduced from $25 per month to just $5 per month. Further, it seems to have lost its "sure thing" clockwork status (0.055 correlation). 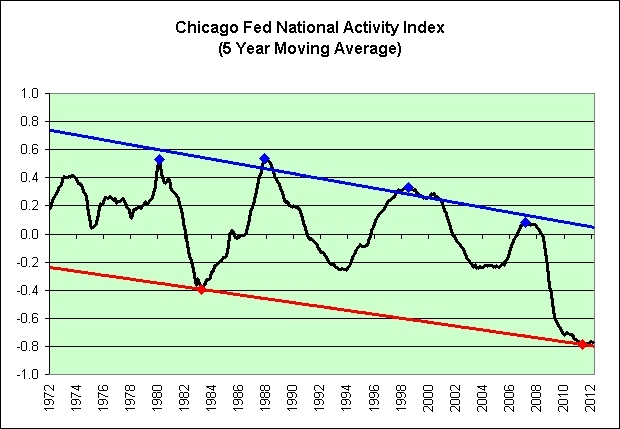 Some would argue that our problems are cyclical and the long-term trend will therefore resume. If true, expect the economy to recover, real yields to rise, and for volatility to all but vanish. When treated, time heals all wounds. 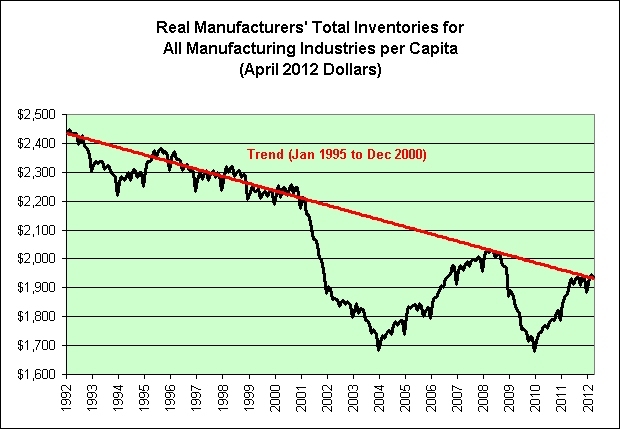 Others would argue that our problems are structural and the short-term trend will therefore continue. 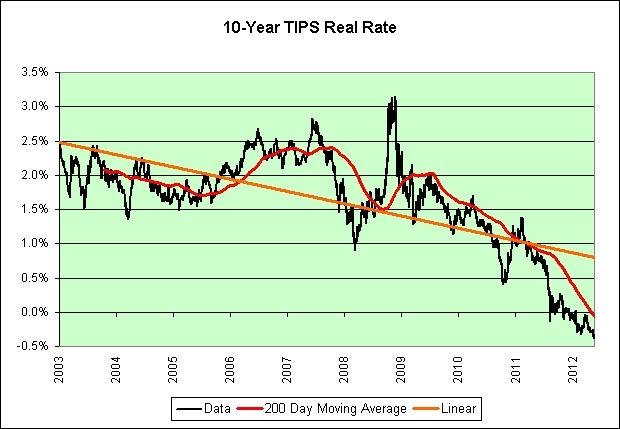 If true, expect the economy to stagnate, real yields to stay low, and for volatility to be the new normal. Left untreated, time festers all wounds. I have been in the latter camp since the fall of 2004. It is and has been my opinion that the era of making easy money off of money is over. 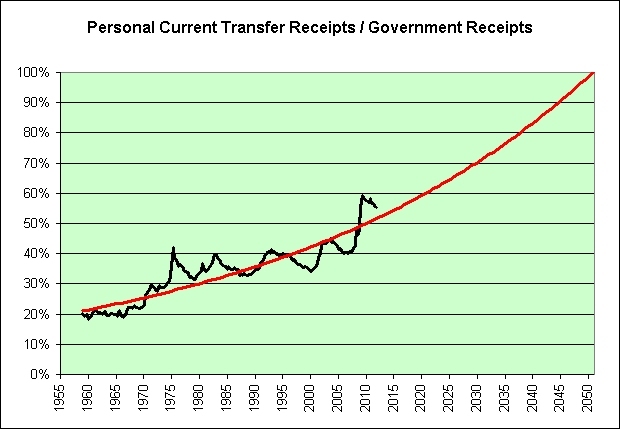 And lastly, I want to point out a serious problem with the long-term chart. 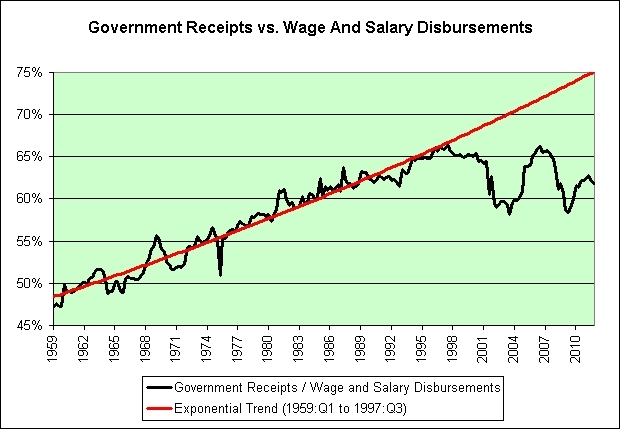 If we extrapolate back to the 1930s, then real non-wages go below zero. That's impossible. It can't happen. 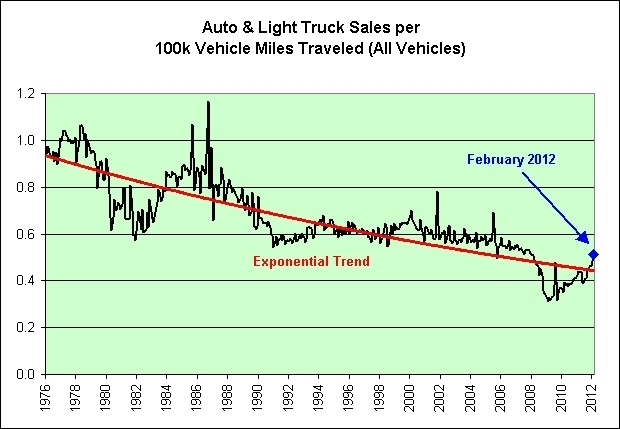 Therefore, it is a fact that the chart does not extrapolate well into the distant past. 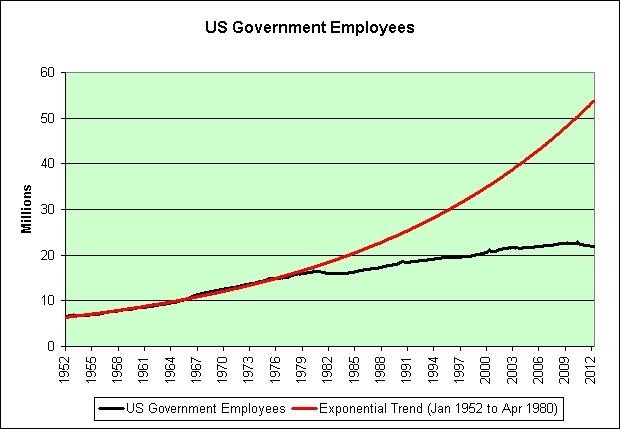 Since this is definitely true, why would we assume that the chart will extrapolate well into the distant future? Just something to think about as you ponder the "sure thing". We just need to step up our game in the 2nd half! I think we can hit 100% but we'll need to stick to the plan. 1. More wars. More wounded veterans means more veteran benefits! 2. More retirement. Demographics! Social Security! 3. More health care. Medicare! 4. More poverty. Food stamps! 5. More unemployment. Automate! Outsource! It isn't always about having more though. Sometimes it is about having less. And lastly, more sarcasm. Can you really ever have too much? Automation Alley promotes regional prosperity through entrepreneurial and exporting assistance, workforce development and technology acceleration. Once again, I'm using the following definitions of bubbles. 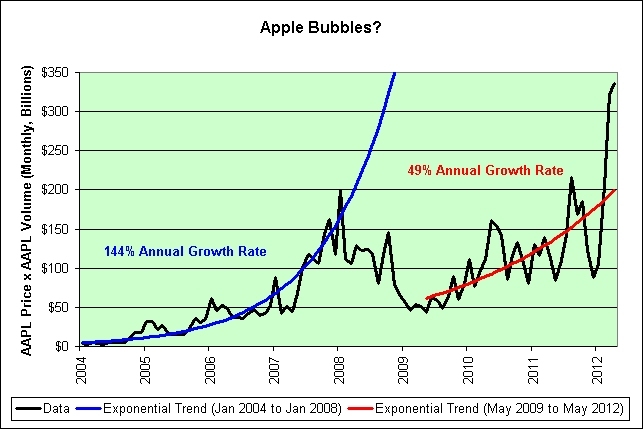 I would argue that the blue trend line shows a confirmed bubble in Apple. 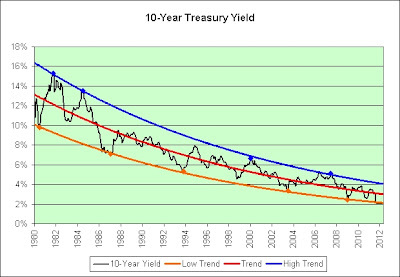 The data failed to follow the blue trend line in a most spectacular way. 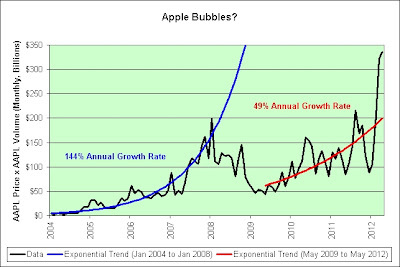 Further, Apple stock traded at $199.83 on December 28, 2007. On January 20, 2009, it hit $78.20. That's a 61% loss from peak to trough. The story doesn't end there though. 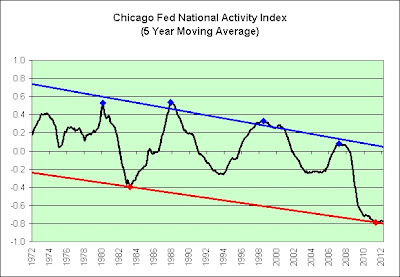 As seen in the red trend line, the trading trend has since recovered and has gone on to even greater heights. The stock now trades at $562.29. Kudos to the true believers who rode that pain out. So what's the risk here? Let's extrapolate forward. Yikes! 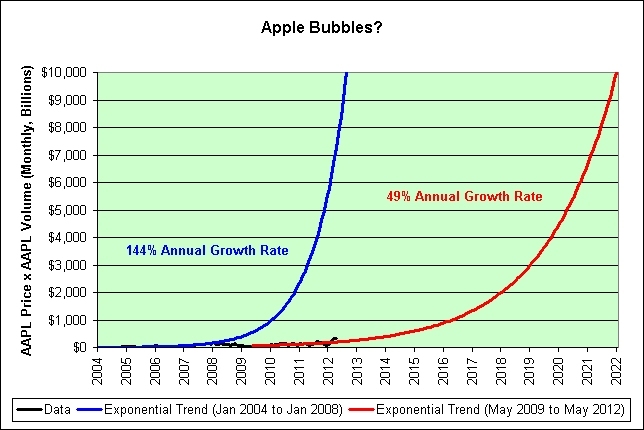 Who thinks that monthly Apple stock trading will hit $10 trillion less than 10 years from now? Anyone? It is possible I suppose (thanks to high frequency trading algorithms and/or hyperinflation), but I'm certainly very skeptical. 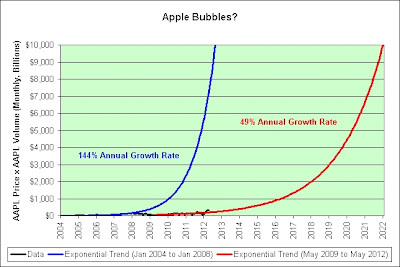 Apple is currently well above its recent exponential trend as seen in the first chart. 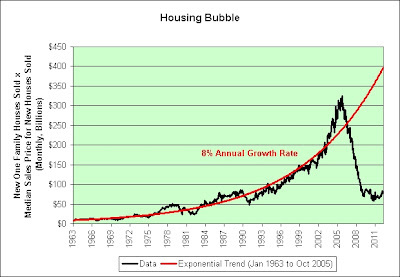 Using my definitions of bubbles, I therefore cannot claim that this is a confirmed bubble. 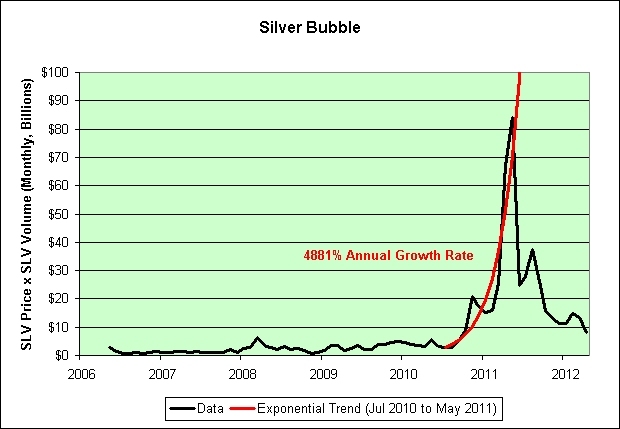 All I can say is that it is a potential bubble. This is not investment advice. There are a few ways this could play out. 1. 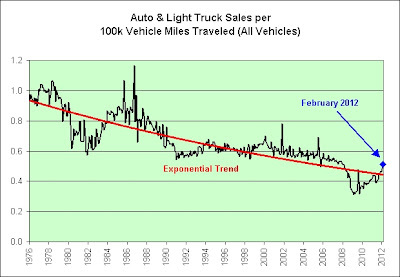 The growth rate could slow to something more reasonable long-term. 2. The growth rate could fail spectacularly at some point. Who can say? As a bear, I tend to lean towards the latter. 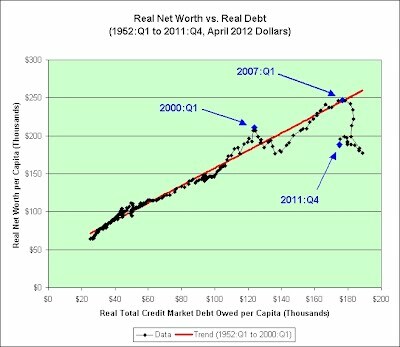 It has already happened twice since 2000 (the crash of 2000 is not shown in the charts), third time might be the charm. In any event, I have no desire to own Apple stock. Too rich for my blood. 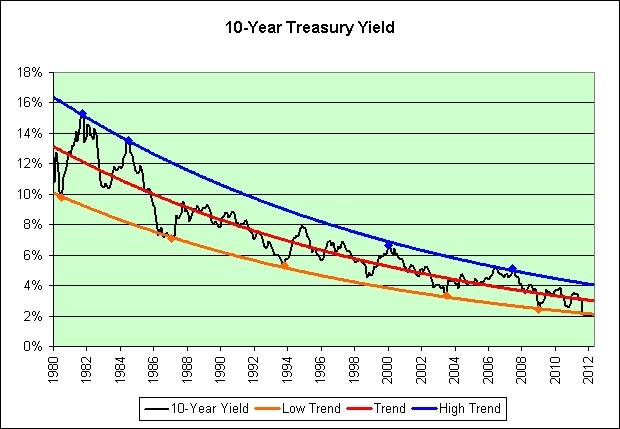 In my opinion, the lowest lying fruit has already been picked twice (blue and red trend lines). Literally. 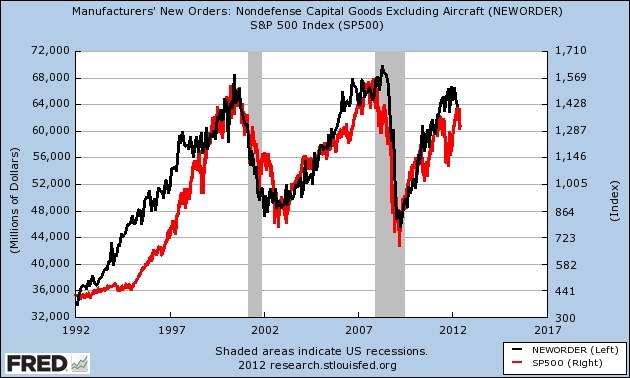 If you buy those definitions, then the following charts show two confirmed bubbles (and their aftermath). 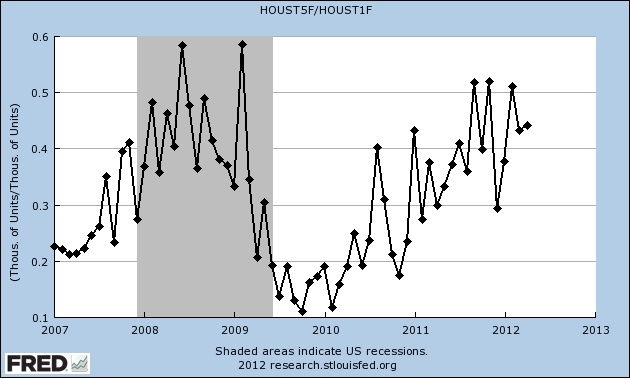 In the chart above, I'm multiplying the monthly new one family houses sold by the monthly new home median sales price. 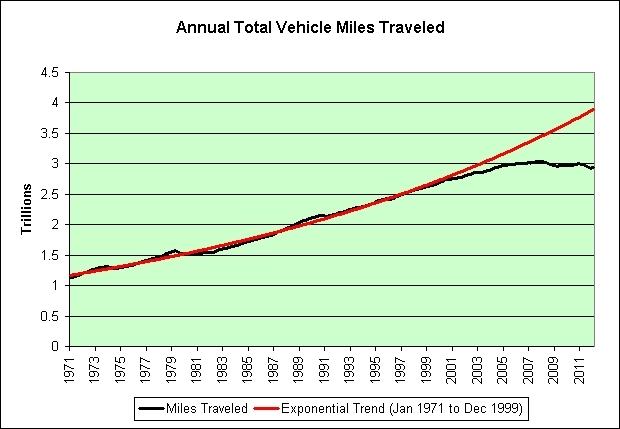 Check out that failed 8% long-term exponential trend. In the chart above, I'm multiplying SLV's daily trading volumes by the daily prices, then summing up a total for each month. 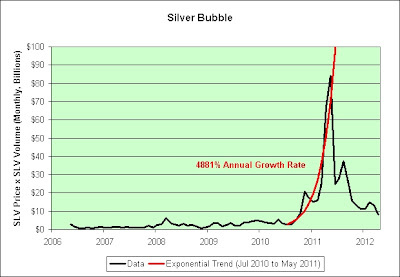 Check out that failed 4881% short-term exponential trend. Also note that the SLV fund made it into the same ballpark as the entire new home real estate market ($70-$80 billion per month each in May 2011). I may want to start firing up the Rubicon machine again. Sigh. I should probably mention that the "You Are Here" point was April 2012. We've slid a bit to the left since then. There was a financial expert on CNBC this morning who said that we should look into managed futures as an alternative to cash and as something that can keep up with inflation. 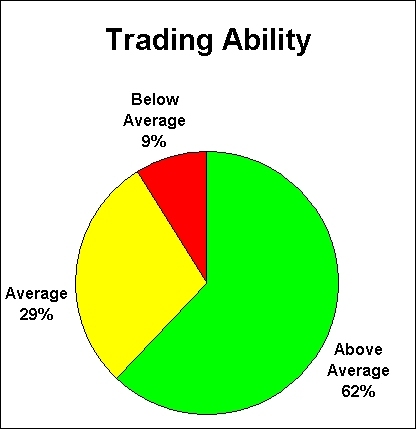 CTAs generally manage their clients' assets using a proprietary trading system or discretionary method that may involve going long or short in futures contracts in areas such as metals (gold, silver), grains (soybeans, corn, wheat), equity indexes (S&P futures, Dow futures, NASDAQ 100 futures), soft commodities (cotton, cocoa, coffee, sugar) as well as foreign currency and U.S government bond futures. Awesome! Packed with all sorts of proprietary zero-sum game derivatives gambling goodness! The financial expert was a bit unclear how zero-sum games can keep up with inflation (for every winner there must be a loser). Let's not let that deter us though. Let's find a good managed futures fund, shall we? Here's what I'm looking for. NEW YORK, April 26, 2012 (GLOBE NEWSWIRE) -- WisdomTree (Nasdaq:WETF), an exchange-traded fund ("ETF") sponsor and asset manager, today announced the WisdomTree Managed Futures Strategy Fund (WDTI) has been recognized as the 'Most Innovative ETF in 2011' by a committee of analysts who cover ETFs in connection with Capital Link's 11th Annual Closed-End Fund and Global ETF Forum. Oh, yeah. That's a lot better than cash. 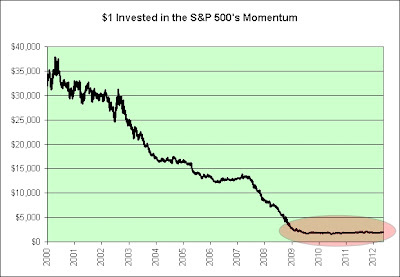 Investors are no doubt sleeping like babies. You know, waking up every few hours and screaming for help. That's how much real purchasing power you could have left after 30 years. I'm assuming the zero-sum game gambling gets you nowhere, we average 2% inflation, and the 0.95% annual expenses keep coming. What's not to like? Of course, I may be wrong. The fund appears to be well ahead of schedule. I can't say for sure that this is sinister, but it could very well be Sinistar. William Pesek is once again in top form today. The only reason Japan is growing at all is excessive borrowing and zero interest rates. 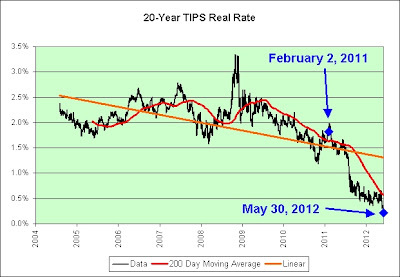 Japan has created a kind of singularity in superlow short-term rates that drive longer-term ones to unthinkable levels. This arrangement has the economy walking in place and financial incentives out of whack. It can not last forever. That is exactly the dynamic that pushed me into long-term US bonds for the better part of a decade. 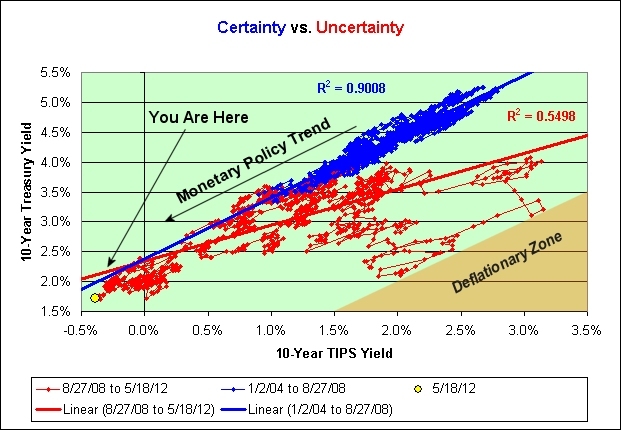 I referred to it as a real yield infection that spreads from the short-term bonds to the longer-term bonds. I would be the first to agree that it cannot last forever. It can, however, last longer than anyone thinks is humanly possible. Japan's central bank is essentially now there to support bond prices. I believe it is our bond market that holds the stock market up. 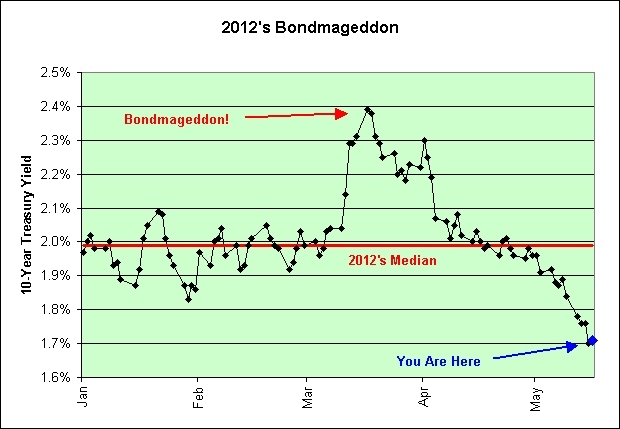 At some point our bond market will be too busy holding itself up. There won't be any ability left to prop anything else up. 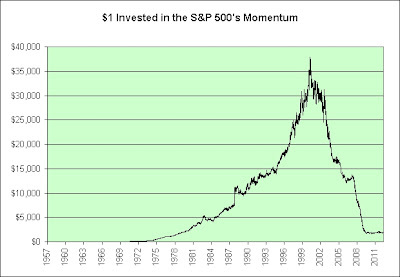 If I am correct to think this way, this would not bode well for long-term stock market investors. 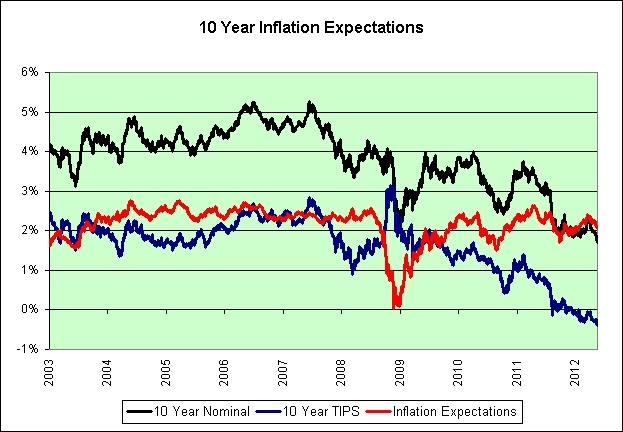 In January, our Fed announced a 2% inflation target and I for one believe them. That's a first step at the bond market looking out for itself. 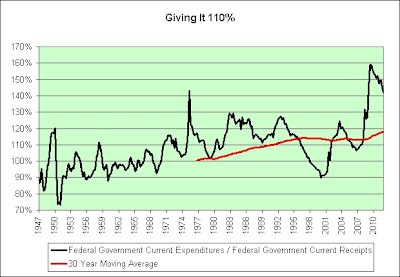 When our government has $15 trillion in debt, it cannot pretend to afford 5% interest payments ($750 billion). It can pretend to afford 2% interest payments though (a mere $300 billion). Behold the power of pretending (i.e., can kicking)! 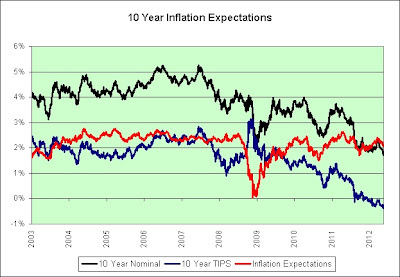 If we continue to go down Japan's path, then I would not be surprised to see a 1% inflation target someday. If Japan is any indicator, it won't be a very pleasant economy at that point. Just opinions of course. What's new? I know the trend is looking really bad for my solutions so far, but this is it. I'm sure of it! Don't you see what this means? If active investors are right, then nothing needs to be done to solve our problems. We can simply let nature take its course. The trend is our friend! Yet the Boston investment giant noted that investors opened more than 6,500 new Fidelity brokerage accounts per trading day during the first quarter, so it's also possible that some of these active investors are novices who are just figuring out this stuff. In theory, that's 4,030 more sustainable jobs per trading day (62% beating the market x 6,500 new accounts per trading day). That's nearly 1 million new successful traders per year! It doesn't end there though. I'm clearly underestimating the effect. 1. I'm only counting the growth in the accounts at Fidelity. There may be other investors opening new accounts at TDAmeritrade, Charles Schwab, ChoiceTrade, ETrade, Firstrade, Interactive Brokers, MB Trading, Merrill Edge, Muriel Siebert, OptionsHouse, OptionsXpress, Scottrade, ShareBuilder, SogoTrade, SpeedTrader, thinkorswim, TradeKing, tradeMONSTER, TradeStation, USAA Brokerage, Vanguard, WellsTrade, and Zecco! 2. Sustainable jobs should grow exponentially as successful traders tell two friends, and they tell two friends, and so on, and so on. Prosperity here we come! Out of curiosity, who helped inspire such confidence? @#$%! I really thought I had a solution this time. Back to the drawing board. Sorry about that. 1. 1980 was definitely a commodity selling opportunity. 2. 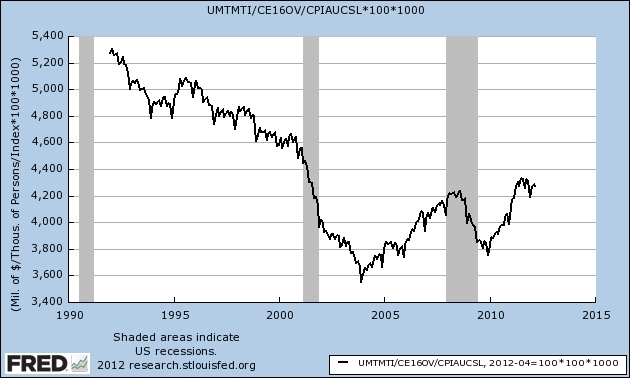 2001 was definitely a commodity buying opportunity. What will hindsight someday say about 2010? I'm unwilling to predict that. 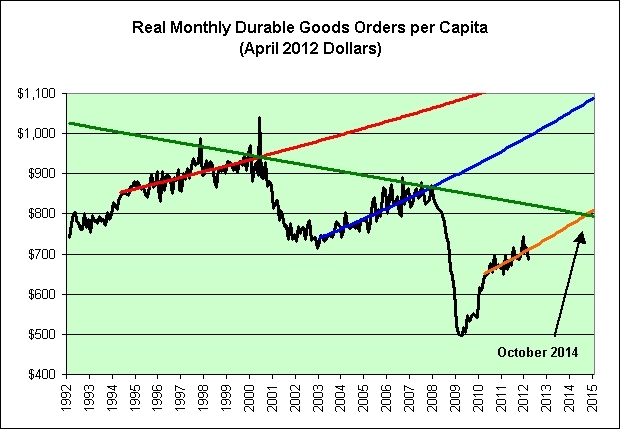 On the one hand, Ben Bernanke is doing what he can to turn us all into commodity speculators. On the other hand, I continue to think that the China story has major plot holes. Here's a version of the chart that forces zero wages to equal zero aluminum production. The correlation isn't as high, but it has a certain common sense quality about it. I must apologize. My last two attempts at solving all of our problems were probably not the best. I really think I've got it this time though. 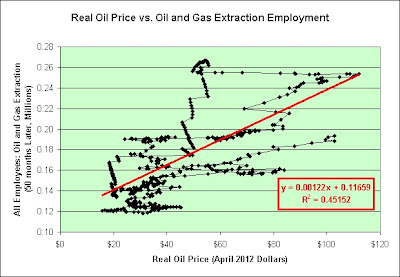 It stands to reason that if higher oil prices can generate a few oil and gas extraction jobs in America, then dramatically higher oil prices can create an amazing number of jobs. Right? Oh yes! I can feel it! 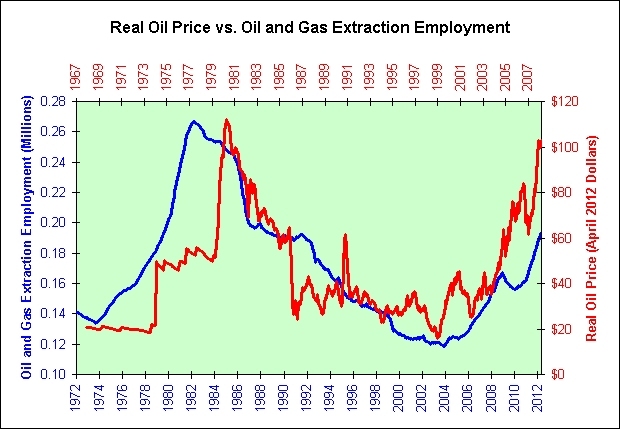 It would seem that as the price of oil rises in real terms, the number of employees in the oil and gas extraction industry rises about 50 months later. And how did I arrive at 50 months? 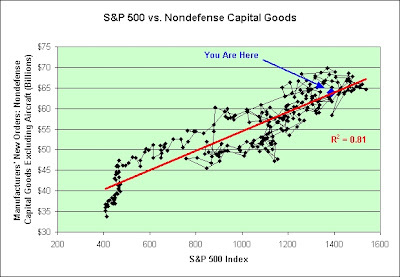 It offered the best correlation in the following chart. Heck, we even have a handy formula now. Let's use it to generate 12.5 million jobs. 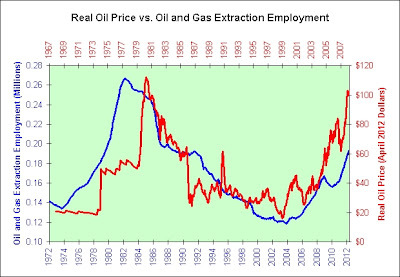 What do we need to get the price of oil up to? Easy. We simply plug 12.5 into the equation and solve for x. 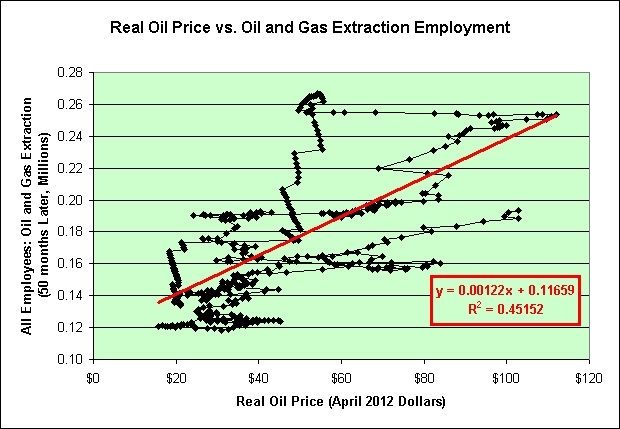 If we want 12.5 million oil and gas jobs, then we'll need oil to cost $10,150 per barrel. Could it get any easier? All we need to do is immediately slap a $10,000 tax on each barrel of oil. Then, we wait. 50 months later comes the prosperity! Oh oh. I think I just went down the sarcasm path again. Sorry about that. 2. Low interest rates for retired savers? A recent Urban Institute study predicts that poverty rates for people at age 67 are likely to decline in the future. Well, that's certainly good news. Let's dig into the study to see if there are any notable disclaimers. 1. Projecting incomes over the next several decades involves much uncertainty, and future developments could lead to outcomes very different from our forecasts. MINT includes historic data through 2008, capturing only the early parts of the recession. 2. 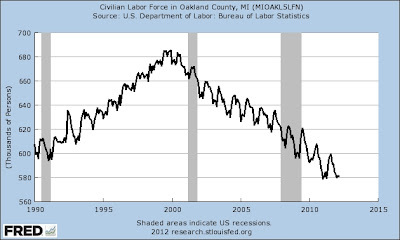 The unusually long unemployment spells that characterized the Great Recession could seriously scar workers who lost their jobs and lead to worse outcomes than MINT projects. 3. Furthermore, MINT calculates Social Security benefits under current law. Promised Social Security benefits may change as a result of reforms needed to address long-term solvency. 4. MINT6 projects about 7 percent lower lifetime average earnings for boomers than did MINT3 largely because of lower than expected actual growth in real wages compared with the 2002 Trustees Report assumptions used in MINT3. 5. Asset income is the most volatile component of retirement income, and the roller-coaster path of investment markets makes this a difficult source of income to project. Ah, good. Nothing much to worry about then. What's the worst that could happen? 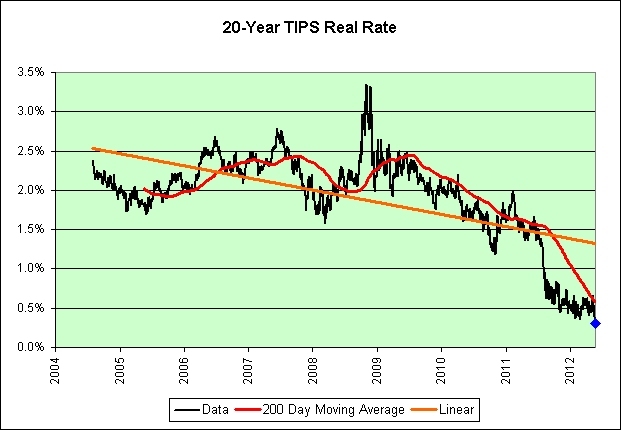 A new record low for the 20-year TIPS was set today at 0.31%. 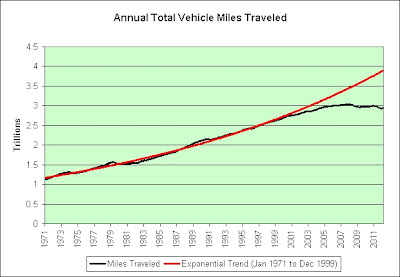 We're also traveling fewer miles. So what could this combination mean long-term? Forget what I was saying in my last version of this post. Like a trapped politician looking for easy answers, I was just blowing smoke. This time I really do have a solution. How do we get fired workers back to work? FIRE them! The government needs to force banks to get back to the trend line. That's 6 million jobs right there! 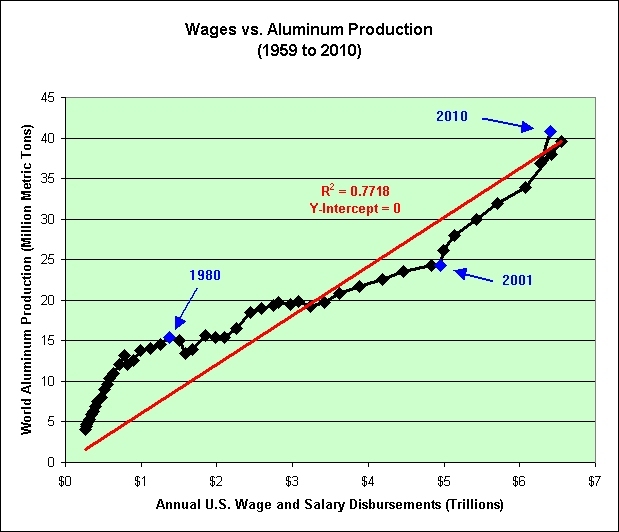 Much criticism exists on the internet and in the blogosphere for the shifting of the U.S. economy to a FIRE economy at the expense of a manufacturing and export-based economy. As the consumer of last resort, many believe that the United States has eschewed productive elements of its economy in favor of consumption to its long term detriment. Oh, please. I'm offering a real solution here. 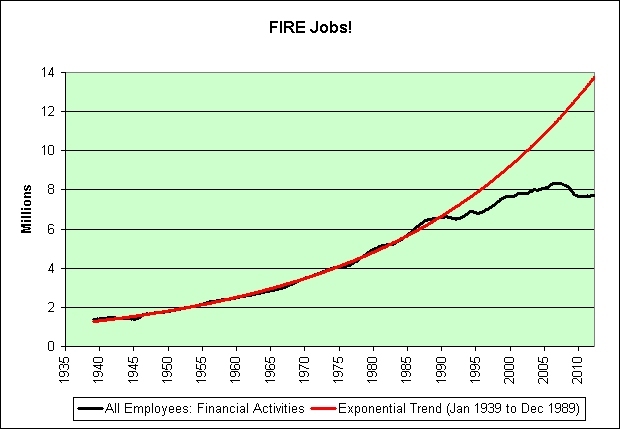 What would the 6 million extra FIRE employees do? I say break them into one million teams of six. Responsibilities: Approves loans. Manages team. Responsibilities: Verifies that loan applicant is living. Responsibilities: Verifies that loan applicant has no income. Responsibilities: Verifies that loan applicant has no job. Responsibilities: Verifies that loan applicant has no assets. Responsibilities: Tracks incoming payments (or lack thereof) and prepares foreclosure documents. What? You think this can't work? You are so cynical! It's already worked once! Well, sort of. Now that times are bad, the single currency has turned into an unbridled doomsday machine. 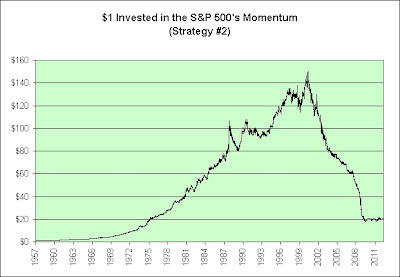 In my last two posts (see links below), I offered two momentum strategies that could have made serious money from 1957 to 2000. I now offer a third strategy using leverage to boost those returns. If you have a "sure thing" winning strategy, then why not always bet twice as much as you have? Genius! 1. If the S&P 500 was up yesterday then it will be up today too. Go double long! 2. If the S&P 500 was down yesterday then it will be down today too. Go double short! 3. If the S&P 500 was unchanged, do nothing. $1 turns into $638 million! Woohoo! 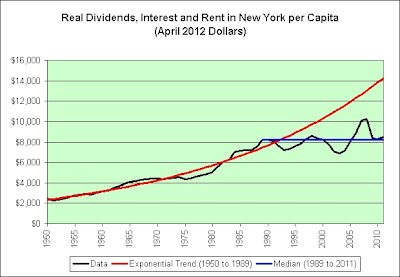 For those keeping track at home, that's a 60% average annual return from 1957 to the peak! Behold the power of leverage! Brace for the sarcasm. It's a doozy. I really hope our country's investment banks are doing similar things with our money. It's a shame not to take advantage of advanced trading algorithms combined with excessive debt! Can't lose! And even if it does lose, that's what the taxpayers are for! 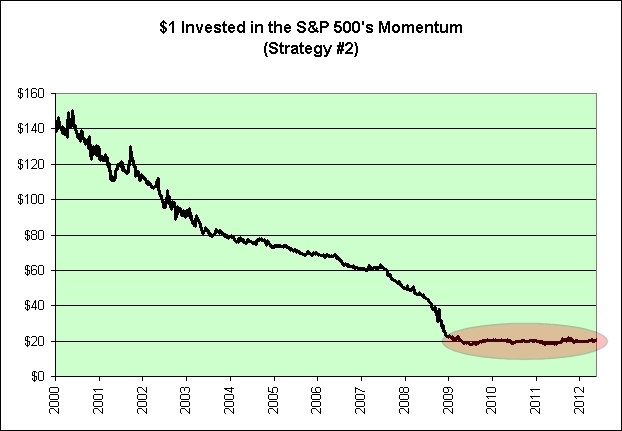 Yesterday, I backtested a simplistic momentum strategy. It once worked. It no longer works. Today, I offer a more complex strategy. 1. If the S&P 500 was up yesterday and the day before yesterday, then it will be up today too. Go long! 2. If the S&P 500 was down yesterday and the day before yesterday, then it will be down today too. Short it! 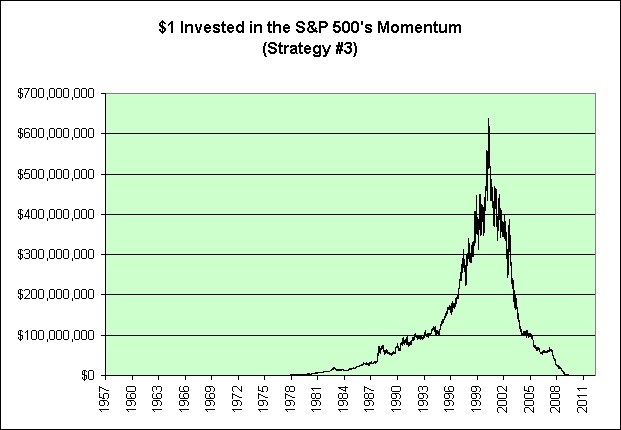 Start with $1 invested in 1957. Here are the results. 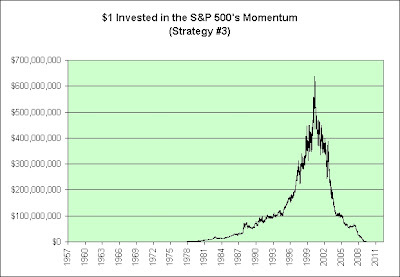 It's not nearly as impressive as the strategy I used yesterday but it did still turn $1 into $147 in just 43.3 years. That's a 12.2% average annual growth rate. Too bad it all fell apart in 2000. I once again offer you one of the more amusing losing streaks. Watch as the strategy gets whipsawed. 2003-04-01 858.48 Short! Lost 1.2%! 2003-04-03 876.45 Long! Lost 0.5%! 2003-04-08 878.29 Long! Lost 0.2%! 2003-04-10 871.58 Short! Lost 0.6%! 2003-04-16 879.91 Long! Lost 1.2%! 2003-04-24 911.43 Long! Lost 0.8%! 2003-04-28 914.84 Short! Lost 1.8%! 2003-04-30 916.92 Long! Lost 0.1%! 2003-05-02 930.08 Short! Lost 1.5%! 2003-05-09 933.41 Short! Lost 1.4%! 2003-05-13 942.30 Long! Lost 0.3%! 2003-05-15 946.67 Short! Lost 0.8%! Ouch. Let's zoom to see the how the strategy has done since 2000. Note the flat line in recent years (as was also seen in yesterday's strategy). For all intents and purposes, this strategy is now dead. It took me, a human, at most a few moments to think up these two momentum strategies. High frequency trading algorithms can data mine 24 hours a day each and every day looking for patterns. In my opinion, the little guy doesn't stand a chance. Day traders beware! Out of curiosity, I thought up a simplistic momentum system today and opted to backtest it. 1. If the S&P 500 was up yesterday then it will be up today too. Go long! 2. If the S&P 500 was down yesterday then it will be down today too. Short it! This system starts in 1957 with $1. The chart above shows how the system would have worked. Amazingly well, wouldn't you say? Well, sort of. I must admit that the last decade was a disaster. And to be fair, it really didn't work all that well from 1980 on (compared to buy and hold). Keep in mind that this system shouldn't technically care if we are in a bull market or a bear market. It bets both ways, like a hedge fund. Unfortunately, this system fell apart starting in April of 2000. Remember the wisdom of Suze Orman that very month? Reminds me a bit of a "sure thing" system I once tried. It worked great until it didn't. Check out one of the more amusing losing streaks as momentum day traders apparently went head to head with high frequency trading algorithms. 2002-10-22 890.16 Long! 1.1% loss! 2002-10-23 896.14 Short! 0.7% loss! 2002-10-24 882.50 Long! 1.5% loss! 2002-10-25 897.65 Short! 1.7% loss! 2002-10-28 890.23 Long! 0.8% loss! 2002-10-29 882.15 Short! 0.9% gain! 2002-10-30 890.71 Short! 1.0% loss! 2002-10-31 885.76 Long! 0.6% loss! 2002-11-01 900.96 Short! 1.7% loss! For example, the system goes long after seeing 884.39 become 899.72 on October 21st. On October 22nd, it was still long at 890.16, lost, and after seeing a day of losses switches to shorting it. And so on. That isn't the only way investors lost though. As I sift through the data I see lots of small gains with a big loss every now and then, almost like little carrots are being handed out to get investors near a whack-a-mole hammer. That's a subjective painting the tape opinion at best. Also note the behavior change in the chart over the past few years. See that flat line? Let me zoom in a bit. That's probably indicative of high frequency trading algorithms going head to head with competing high frequency trading algorithms. May the best computer win! Perhaps Jamie Dimon should think about upgrading. The hunter has apparently become the hunted. And one wonders why I am not content to play in the casino? Seriously? The less I trade the better. I have absolutely no desire to compete with that. The lowest-lying fruit is gone, and probably half the tree with it! 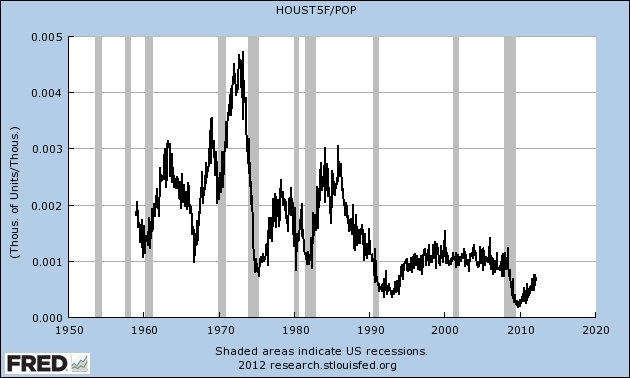 They say that predicting the next recession is a fool's game. Well, sign me up. Why not! You are probably wondering why I am using the "or before" disclaimer in my prediction. Well, it's a bit like predicting a volcanic eruption. 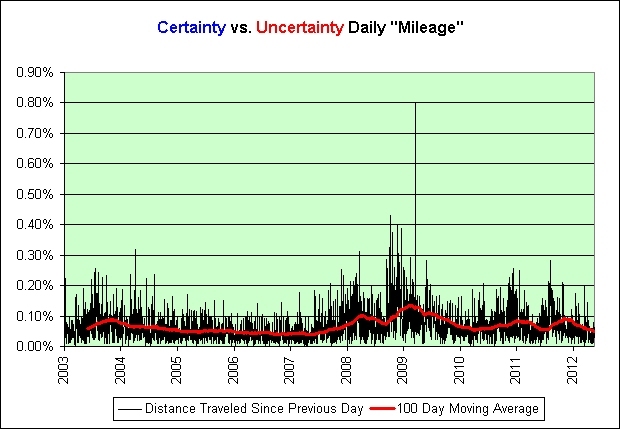 As seen in the following chart, the pressures are apparently already here. Just can't say exactly when it will blow. Could be tomorrow. Could be October 2014. Who knows! Check out those downward trend lines in both charts. 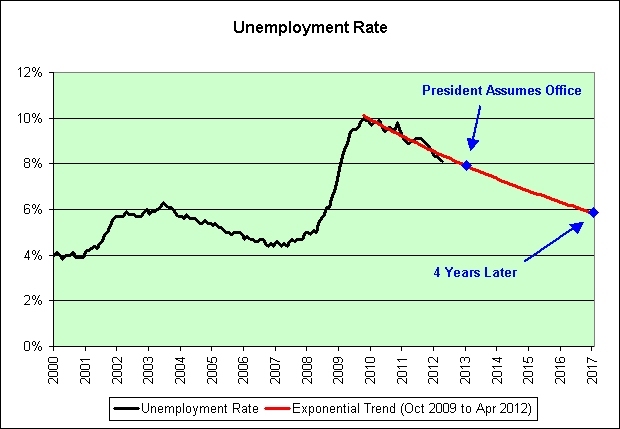 I also find it interesting how accurately the extrapolation of the trend line in the second chart is matching reality. It's shooting from 1995 through 2000. It hit both 2008 and 2012 right on the targets. Go figure. And lastly, I assume here that the economy will continue to deteriorate over the long-term. I do run an illusion of prosperity blog though, so if nothing else I am being consistent. Want scary? 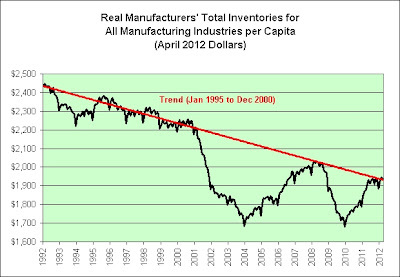 Check out real inventories per civilian employed. Good luck on that one! Got volcano? I've got to tell you that this has been on my mind for nearly a decade. I finally have a solution. I don't know why I didn't think of it sooner. Let's just do what worked in the past! 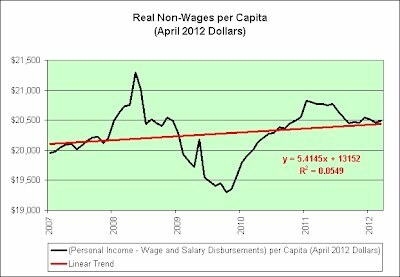 As seen in the chart, all we have to do is follow the red trend line. That's 31.8 million more jobs! 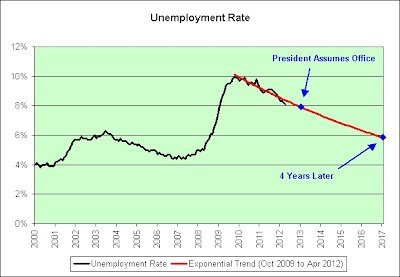 There are only 12.5 million unemployed. There would be so many jobs we wouldn't even have enough workers to fill them all! Genius! Once again, I have a solution. China's consumer confidence in the first quarter rose to its highest level since 2005 because of falling inflationary pressure and the government's determination to deflate property bubbles, analysts Nielsen said in a report on Thursday. Nothing inspires confidence like a popping real estate bubble! 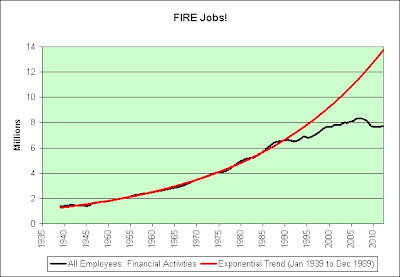 This is exactly why financial planners are paid the big bucks! I would bet that the average well above average investor can easily average 15% returns. It's so easy. We start with some 0.0% I-Bonds. 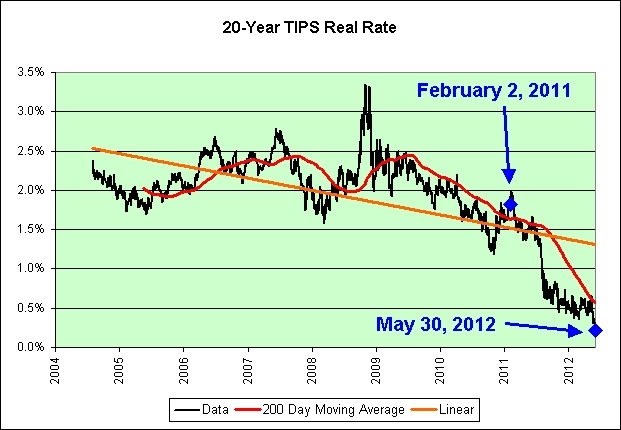 Add in some 2.80% 30-year treasuries and S&P 500 action. And finally, top it all off with some real estate for diversification. What could possibly go wrong? 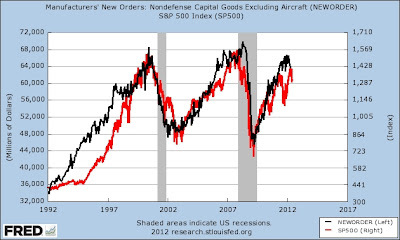 So if your stash is in equities, you may want to let it ride. Yes! That's exactly what we should be doing in retirement! Grandbaby needs new shoes! Let It Ride is a 1989 comedy film. It stars Richard Dreyfuss as a normally unsuccessful habitual gambler who experiences a day in which he wins every bet he places. Let It Ride is played at a relaxed pace relative to other casino card games, which has made it attractive to older players and to table game neophytes. Attractive game for older players! Woohoo! After winning money in a casino, taking your winnings and continuing to gamble with them instead of cashing out. I won a thousand bucks in Vegas last night, but I lost it all after I let it ride. Lost it all after we let it ride? Not going to happen! Feeling lucky! 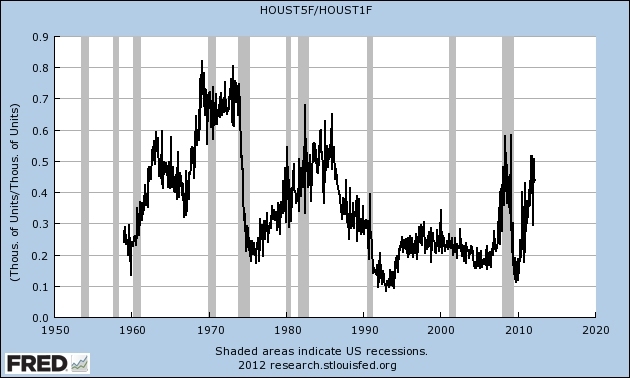 The following chart shows "Privately Owned Housing Starts: 5-Unit Structures or More" per capita. 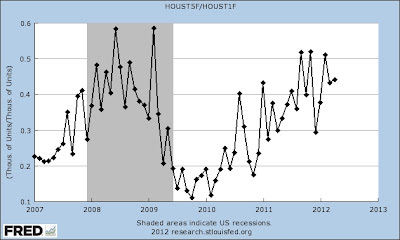 Bull market in rental construction! Hurray! What? Can't see it in the chart? Let's try again. The following chart shows "Privately Owned Housing Starts: 5-Unit Structures or More" per "Privately Owned Housing Starts: 1-Unit Structures". See it now? Let's zoom in for a closer look. 0.44! For every two single unit housing starts there is nearly one 5+ unit start. As I was saying, bull market in rental construction! Hurray! As seen in this last chart, times haven't been this great since the great recession. Before you know it, everyone is going to be a landlord and we can all make great sums of money renting each other places to live. That's real prosperity! Okay, maybe not real prosperity. It is real sarcasm though. That's something I guess.